People with gambling addictions often end up deep in debt. When gambling debt becomes a problem, the debt has often gone beyond money owed to casinos or riverboats. Instead, you may have credit card debt, loan debt, and even home equity debt all associated with gambling problems. There are ways to handle all of the debt you’ve created through gambling. Before you deal with gambling debt, you need to treat the gambling addiction. The first step is to realize that you have a gambling problem. For your sake and the sake of your family and loved ones, take some time to look at your situation and evaluate whether you have a gambling addiction. For example, you might have a gambling addiction if you’ve ever gambled away bill or food money. If you’ve been gambling with credit cards, close them. Normally, closing a credit card doesn't help with your credit score. However, if closing your credit cards keeps you from creating more debt, then that’s what you need to do. You can put a freeze on your credit report to make it more difficult to open a new credit card or loan account, as they require a credit check before issuance. Many gamblers think they can win enough money to pay back their debts, but quite the opposite happens. You only end up creating more gambling debt to repay. Even if you did win enough money to pay off your debt, chances are you would gamble that money away too, thinking if you won once you could win again. Your health insurance provider may pay for treatment for a gambling addiction. Check with your insurance provider to see what options are available. Some states will even cover the cost if insurance doesn’t pay for it. Your state Consumer Affairs Office may have more information about state programs for a gambling addiction. Write a list. Start by writing a list of everyone to which you owe money. Some of your gambling debt may be on credit cards; you may have overdrawn bank accounts; or, you may even owe money to casinos. Include every debt that comes to mind on the list. If you learn of new gambling debts, add them to the list. The key is to know who and how much you owe so you can take action. Borrow money from family or a friend. If you owe bookies or loan sharks, you may have to borrow money from a friend or family member to repay the gambling debt quickly. Borrowing money from a loved one means you’ll have to be honest with them about your gambling problem, but, in return, you may gain a support system to help deal with the addiction. Sell your assets. You could sell valuable assets and use them to pay off your gambling debt. That’s if you haven’t already sold them to get more money for gambling. Furniture, electronics, jewelry, or even your car are all items that could be sold to pay off debt. Get a second job. Working several extra hours each week can help you come up with more money than if you depended solely on your primary source of income. If you can’t find a job, you may have a hobby that you could turn into a small part-time business. Negotiate a settlement payment. 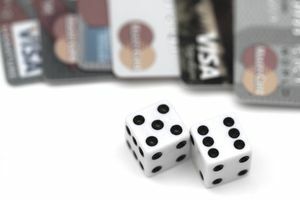 Your creditors may be willing to accept a settlement payment on your gambling debts if you can come up with a percentage of what you owe within a few days. Gambling debt, including debt incurred from casinos or charged on credit cards and loans, can be discharged in bankruptcy. It’s important to know that any creditor can object to the bankruptcy filing by claiming you incurred the debt under false pretenses or through fraud. For example, if you took out a credit card cash advance knowing you didn’t have the money to repay the advance when you borrowed it, the creditor can ask the court not to discharge the debt. However, the creditor has to prove that you committed fraud. Bankruptcy may be your only option for dealing with a gambling debt. Should You Pay an Adult Child's Debt?